As mentioned numerous times already, CRISPR is a genome-editing technology that can precisely and efficiently target specific DNA sequences and either delete or make changes to genes. The technique has also been modified so that it can be used to switch genes on or off. However, all these functions rely on the matching of a guide RNA molecule to the DNA sequence. Although this step, finding a guide RNA sequence for the desired DNA sequence, is relatively easy, these guide RNAs will also hit other regions of the genome. These so-called off-target effects can interfere with an experiment and ultimately, also hamper attempts to use CRISPR in therapeutic gene-editing settings. Therefore it is crucial to have a better understanding of how the guide RNAs find their targets so that better guides can be designed. Chari et al. (2015) used 1400 guide RNAs in various human cell lines and analysed the off-target effects, which were affected not only by the sequence of bases but also the three-dimensional structure of the targeted DNA sequences (chromatin status). Using this experimental information they designed a new, freely available software that is better at designing guide RNAs. Other programmes rely on algorithms that only take the raw DNA sequence into account. Although this recent paper (Schumann et al., 2015) did not yet utilise this new software, the researchers around Jennifer Doudna, one of the CRISPR pioneers, did succeed in editing human T cells. These are white blood cells that form part of the body’s immune system and are important for clearing infected or cancerous cells, but are themselves the target of the human immunodeficiency virus (HIV; see image). 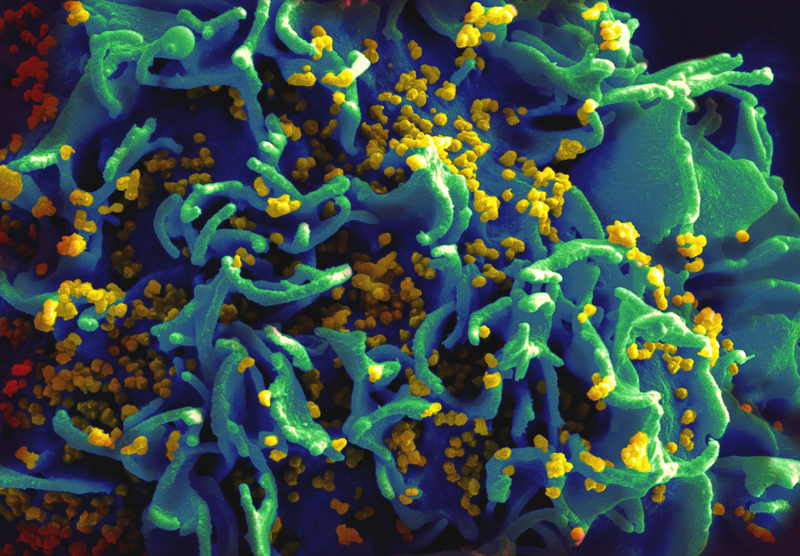 In particular, HIV particles force entry into some T cells by attaching to a protein receptor called CXCR4. Schumann et al. managed to use CRISPR to drastically reduce the expression of CXCR4 on human T cells – eventually such T cells might be injected back into patients to make them more resistant to HIV infection. Sometimes T cells can become inactivated or blocked, rendering them unable to perform their functions. Often this blockage is carried out by a protein called PD-1, which is located on the surface of T cells. Some cancer immuno-therapies – notably melanoma treatment – target PD-1, allowing the cells to become active once again and attack the malignant cells. Schumann et al. also used CRISPR to make small changes to the PD-1 gene in T cells, showing that it might be possibly to replace or complement some forms of cancer therapy with gene-editing in the future. This entry was posted in CRISPR, Factual and tagged CRISPR, CXCR4, gene editing, guide RNA, HIV, immunotherapy, PD-1, T cells by Victoria Wang. Bookmark the permalink.